The basinbeehivebubblesoxygenperoxidepiperatewater of reaction can be increased using the catalyst, manganese oxide. When manganese oxide is added to hydrogen peroxide, basinbeehivebubblesoxygenperoxidepiperatewater of oxygen are given off. It then bubbles up through a basinbeehivebubblesoxygenperoxidepiperatewater shelf into an upturned glass jar filled with water. 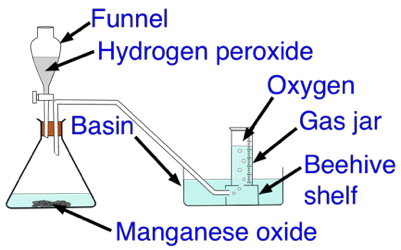 The gas collects at the top of the jar, forcing basinbeehivebubblesoxygenperoxidepiperatewater out into the basin below.